This entry was posted on May 14, 2015 by Allison Holland. 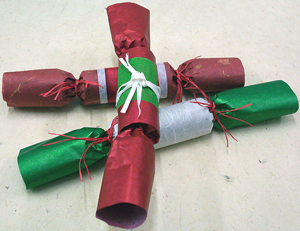 These lovely Christmas Crackers were made using papers available from this web site. 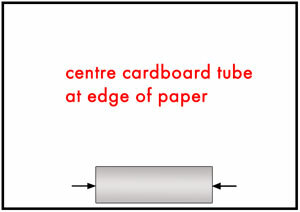 The cracker on top and the one in the foreground are made from Metallic Papers which are available from most stationers, while the cracker behind was made with Banana tissue paper which is highlighted by bold husks of banana fibre. Alternatively, the Marble with Gold Papers are equally effective. The contrasting papers used to decorate the body of the crackers are from the Mulberry range and the ends have been secured using paper yarns. Any of our light-weight papers, other than the Tissue Rag which is slightly less malleable, can be used to good effect for this project.